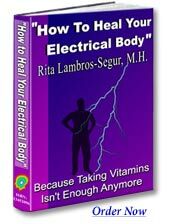 "How To Heal Your Electrical Body"
This ebook is unlike most others on the web. Our customers agree it is quite unique in both looks and functionality. A no-nonsense discussion of electrical principles and how they apply to YOUR health! Mineral, herb and vitamin combinations . . . these are nothing new, right? To tell you the truth, I didn’t think so either, but I went through a real learning experience. When the body receives properly formulated information specifically designed to release stored toxins from the cells and promote the return of normal functioning, the results can be astonishing! How To Heal Your Electrical Body is all about looking at things differently. For many of us, these applied principles were the last resort. Nothing had worked in the past; we were skeptical and had little hope left. When you come across products that take these principles in mind, it’s quite a challenge to give up everything you thought you knew about nutrition. But it’s a necessary step if you are to understand the concept of frequency nutrition. Think about this: all life is vibrating energy. An atom is an example of an energy system or metric consisting of electrons, neutrons, protons . . . and these are components of electrical charges that create matrices. Matrices hold energy in form. So that which is a tree or a table or a human being, is that because of the matrix containing it. One hundred years ago, fruits and vegetables contained innate electrical information that sustained the body. Today, however, if you eat fruits and vegetables from your local supermarket, you just don’t have that same process. It’s imperative that we find whole-food products that speak the language of the body because when we ingest appropriate electrical information that the body recognizes, wonderful things can occur. True nutrition isn’t concerned with symptoms. There are a host of diseases, but only one cause - being out of homeostasis or normal functioning. What causes this lack of homeostasis? Toxins and malnutrition. It’s my goal as a researcher, to point you in the direction of an ambitious new approach to health and well-being. "So exactly what's in the ebook?" To give you a better idea of what's covered, I've listed the top questions I've researched over the years as well as had folks ask me personally. All of these and more are answered in the ebook. Here they are . . .
On environmental pollutants . . .
"What’s all the fuss? Haven’t we always had pollution? How do these same pollutants affect our genetics, or better yet, can poisons actually alter our genes or mimic human hormones?" On auto-immune diseases . . .
"What are the possible causes of these kinds of disorders—Type I Diabetes, lupus, rheumatoid arthritis, etc.? Can I prevent them? If I am afflicted with these types of problems, is there any hope of relief?" On the two diverse branches of medicine . . .
"I've heard a lot of people talking about there being only two branches of medicine—the atomists and vitalists. What exactly are these and what is their 'modus operandi?' Why should I care?" On electrical homeostasis . . .
"What exactly is electrical homeostasis and how can I achieve it? How does one measure their own electrical homeostasis?" About product manufacturing . . .
"How does one decide which health supplements are better than others? Does the way a company grows, harvests, formulates and markets their products really affect their efficacy? What constitutes a ‘dead’ nutrient?" "What happens when we ingest the wrong kinds of calcium? What constitutes the ‘right’ kind of calcium, or of any nutrient, for that matter?" "When the body displays negative symptoms, is it moving towards health or should we force it to change directions in order to heal?" "Does our body have a built-in shut-off mechanism which prevents fevers from going too high? Why would anyone want to ‘build’ a fever?" Body regeneration . . .
"Does the body regenerate itself? If so, at what rate does each body system change? And why am I still creating the same body?" Immune system defense . . .
"Why should I inhale through my nose, instead of my mouth? When a virus attacks my body, what does my body do in defense? And more importantly, if my body doesn’t defend itself well, what can I do to ensure that it will in the future?" Candida albicans . . .
"What’s this latest craze about my body being overgrown with candida? Isn’t candida a necessary internal component of my system? And, What causes candida to become so rampant in my intestines and what makes it leave my digestive area to become systemic throughout my entire body?" OOPS! I almost forgot the most popular question . . .
"Exactly what products and methods are YOU using that have been bringing you success? Can you teach me how to use the exact same methods and how do I find these health supplements?" "O.K. Let's wrap this up!" Now that you know what you stand to gain from learning this information, let's consider what you have to risk. Too high? Yeah, my thoughts exactly. And I'll tell you what. I'll make it easy for you. I'll give you 30 days to make up your mind! If you don't agree that this ebook teaches you how to properly harness the power of frequency nutrition, just send it back for a full refund. No questions asked! In this world of health choices, you need knowledge to succeed! Do yourself AND your family/friends a favor... Don't pass up this opportunity to learn! P.S. I've decided to throw in 2 bonuses for everyone who orders this month. For all of you who’ve decided to enhance your knowledge by purchasing How To Heal Your Electrical Body, I’ll mail Dr. Aaron Flickstein's special report entitled "Infrared Thermal System For Whole-Body Regenerative Radiant Therapy" entirely free of charge to your home address. This report details the efficacy of far infrared radiation therapy. It examines the safety of infrared radiant energy and its exceptionally useful effects on many health disorders. Includes case studies from Japan, China and Europe. A MUST QUICK-READ. Along with your "Infrared Special Report", I’ll also mail our full color catalog which not only offers cutting-edge health products, but also the reasons behind detoxification, colon health and skin maintenance. An alternative to purchasing vitamin/mineral formulas, laxatives, and antibiotics are reviewed as well as healthy weight-loss recommendations. Here's how you can get your copy of How To Heal Your Electrical Body for $17.95. Enjoy! Choose your preferred ordering method below and place your order. We'll process your order and email download instructions shortly afterwards. Click HERE if you prefer to print an order form that can be mailed or faxed.